The word "Saaremaa" means "land of islands" in Estonian, and Saaremaa Island is an inexplicable magnet which, each summer, attracts travellers from Latvia and far beyond. The bright blue sea is unusual because of the wealth of islands in the area of Saaremaa. There are unique meadows of juniper, there are antique and unusual churches, there are historical monuments of importance to the peoples of the Baltic States (castle mounds, a castle, an unprecedented wealth of fauna - birds in particular, windmills, Europe’s most impressive meteorite crater, ancient fishing villages full of the habits and specifics of island dwellers). These are just a few of the special aspects of this island. Its capital, Kuressaare, is one of the most beautiful small towns in Estonia, featuring an ancient City Hall and surrounding square. Kuressaare also can boast of one of the most impressive Medieval castles in the Baltic States - it is absolutely unique in its appearance. It is worth spending time at one of the town’s pubs. Saaremaa always welcomes travellers, and its tourism infrastructure is well thought out and of a high level of quality. The island is a true paradise for those who seek calm relaxation, but also for those who enjoy active holidays - hikers, bicyclists, sailors and observers of nature. 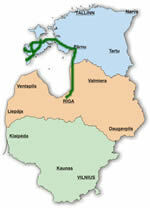 Departure in the morning from Riga. By car: Riga – Pärnu – Lihula - Koguva. Overnight in a guest house on Muhu island. Cycling on Muhu Island, approximately 28 km. The route starts and ends at the Liiva church. The route covers Estonia’s third largest island, Muhu Island. It is known for its vast juniper fields, its small fishing villages, and the magnificent Juigu cliffs, which open up a view of the other small islands in the Monzunda archipelago. The Liiva church is one of the oldest churches on Estonia’s islands. Approximately half of the route is along a paved road, while the other half runs along gravel roads. Sightseeing in the town of Kuressaare. We recommend a visit to the bishop’s castle and park, as well as City Hall square. Overnight in a guest house in Kuresaare. Points of interest en route: The Viidumäe National Park with its viewing tower, the church in Kihelkonna, the Odaletsi streams and nature trail, and the Panga cliffs - the most impressive cliffs on Estonia’s islands. Cycling along the Tagameisa Peninsula, up to 30 km. The route starts and ends at the village of Vere. The route covers the quiet and, in terms of nature, most unusual areas of Saaremaa Island. The Tagameisa Peninsula is meant for active bicyclists who enjoy a bit of adventure and something of the sport of orienteering. The route mostly runs along narrow and little-travelled paths of earth and gravel. In some places the route passes along the seashore, where geological rocks are uncovered in some places. There are beautiful views of the sea, the bays of Saaremaa, and Hiiumaa Island. Please note that this route will take more time than would a route of an identical length but along a paved road! By ferry: from Kuivastu to Virtsu. Fahrt mit dem Auto: Virtsu - Pärnu - Riga.